Churchville Photography Club – 2018 Mar 5 – Ray Hennessy “Wildlife Photography”. The quality of light on this particular evening just after the sun set was some of the best I've seen in a long time. I figured after the sun dipped below the horizon that the shoot with this Red Fox would be over but I was completely wrong. The sky opposite the setting sun turned this lovely soft pink hue that you see in the background. The ocean was also in the background which adds the wonderful fade to blue in this photo. The best part was even after sunset there was still direction to the light which is what helped to light up this fox's face so nicely. The deep snow in this particular spot didn't hurt either. 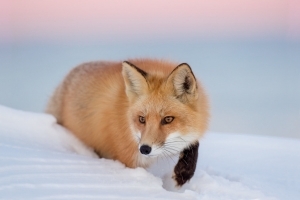 My goal on this trip was to get a photo of the Red Fox in the snow and this is certainly one of my favorite images from the day. Taken in southern New Jersey.